Welcome to CatholicMom.com’s Small Success Thursday, where we take a look at our lives and see what’s going right (no matter how small that might be). Be sure to head over to that link so you can read other Small Success stories. We all should be encouraging each other! I’ve been off my blog pretty much since Easter. I was doing my best to relax and enjoy the Octave, and then I got busy with some family things. But her furniture arrived on Monday, and despite having been shipped freight in the end, it seems to all be intact, as well. Mom’s been getting her things unpacked, and I’ve been making trips over to the apartment to help her with odds and ends when she needs me. And she’s much more relaxed now that she’s getting settled, too. I told her she reminded me of Maureen O’Hara in The Quiet Man. And I got to spend a lot of quality time with Mom this week. We went antiquing, we watched some neat movies as a family (regardless of how much homeschool had gotten done that day), and generally hung out together. It was really nice, and I’m glad we had that week-and-a-half together, despite it throwing off my schedule so much. I really love my mother-in-law, and I’m glad she’ll be living close by. How about you? What are your successes this week? 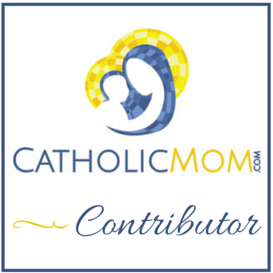 Blog about it and share the link at CatholicMom.com or tell me here in the comments! Yes, I sure do know. I love my in-laws, and my parents love Nathan (and he loves them back). We are SO blessed to have good relationships with them. And I’m THRILLED for the girls, especially, to have Mom so close to us. Nathan’s cousin’s kids were sad to lose Auntie Gretchen, but my 14yo said, “You had her for my whole life. It’s our turn now.” LOL!!! I love that movie…may have to go pull out the DVD….So glad you have the grace of being able to have her near, for your whole family. Thanks for being part of SST. I love that your MIL is moving close to you. Good for you for learning to be charitable. It’s not an easy thing when you have family of varying religions. Glad she is settled and loving it. I liked having my MIL close. While she did not babysit often, she was there when we needed her. Now we are a little further away and I ahve to make an effort to include her or make sure Hubby has called her recenlty especially now that my parents have moved back to town.